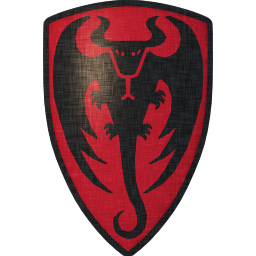 I designed myself a heraldic emblem of dragon to be used on a shield. I would be interested in hearing what do you think about it. Ah... The old BullWorm emblem. It looks great. I've tried to design a logo for my sword group on several occasions but I have no artistic talent or any sense for graphic design software. Love it and it also sort of has a bat like look plus a little bull mixed in. I also like it just as a drawing and design: Nice use of positive and negative space i.e. good composition very aesthetically pleasing. I'll go against the grain and say that while I like it from an artistic and coolness standpoint, it has a look that is more modern than historical. So if your intent was something that wouldn't look out of place in reenactment, etc., this might not work. For display or to carry around the faire, it's great. It's still much better artwork than I could come up with! You are right, it doesn't have the feel of period art, however that was sort of the point. I might try to make more period looking version too - probably with the dragon dexter segreant and with more "curly" lines. For a black beast I'd choose a white or yellow backgroud,just to keep it within the rules of blazon, which state "no colour upon colour, no metal upon metal" -a matter of contrast. This would make it look more historical. But... it is your shield, it's up to you. Do you have more information on these rules? As a graphic designer I too have dabbled in my own heraldry and would welcome information that lays out guidelines historically. I have many books in my reading list that cover basic heraldry. Most are inexpensive and worth a read. The rules vary by continent, country, region and century. There used to be some freeware on the web for basic heraldry, I'm not sure if the site is still up or not. As a side note, there is a graphic designer who makes a profit by turning out high quality devices for people. That is not necessarily true in this case - outside of western Europe, sable/black is sometimes considered fur and can be placed on gules/red. For example as on flag of Albania. You can also find quite a bit of information about heraldry on wikipedia. I have not used it extensively, but enough to come up with my own heraldry, and general poke-around-ness. I also like that it uses some of the heraldry terms when picking out the charges, colors, and such.